Tesco Everyday Value Pudding – Another pleasant basic pudding and good value. Co-op Loved By Us pudding – they make small and large versions, a little bit more expensive but tastes good. 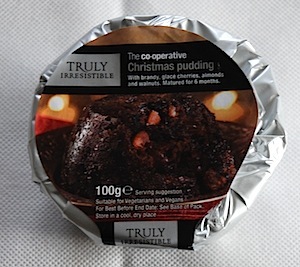 Co-op Christmas Pudding – A more luxurious pudding that comes in small and Large, very nice. 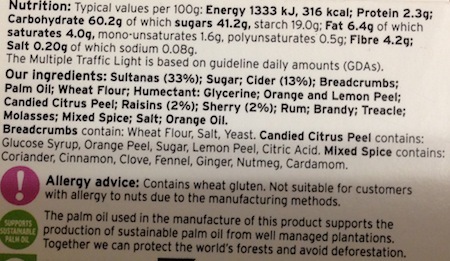 Sainsburys – A nice pudding that does not have strong flavour. Large and small puddings available. If I had to choose I would go for the Co-op puddings as I like that they do small portions. 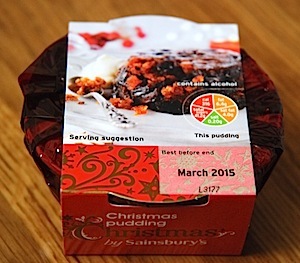 A vegan dairy free Christmas pudding from Sainsbury’s supermarket. I like that they do small and large versions of this pudding, which is great as not everyone likes it. The pudding is fairly good, it has the traditional spice and fruit. This one is not too heavy on citrus and has more of a fruity sultana flavour. The pudding is pleasant enough. Each pudding is suitable for vegetarians and vegan as far as I can tell. Per 100gram serving is 316kcal. Sold in Sainsburys. 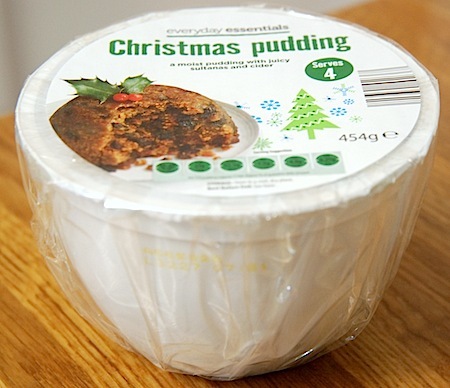 A vegan Christmas pudding from the “Loved by us” range of the Co-operative supermarket. Thankfully the Co-op do a small Christmas pudding, and they do large versions too. This little one was £1.50 which is OK, but I expected it to be cheaper, especially when you compare it to the Aldi and Tesco budget Christmas puddings which are under £1 for a large 454gram pudding. This one is enough for one person or two at a push, it is 100grams. The co-op do label suitable for vegans on the pack which I like. The pudding is rich and quite fruity, the citrus flavour is quite strong. 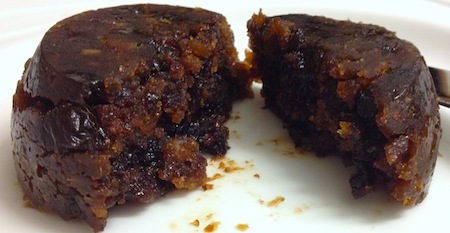 As with all Christmas puddings this one is stodgy and sticky. It has brandy, cider and sherry in it. Ready in about 40 seconds in the microwave. I enjoyed this pudding, it had all you want in a pleasant pudding. Ideal if you only want it for one or two people, but from a budget point of view I would go to Aldi and buy their Everyday Essentials Christmas pudding. Each 100gram pudding is suitable for vegans and vegetarians. Per 100grams is 320kcal. Sold in the festive section of the Co-operative supermarket. 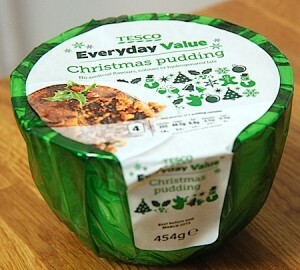 A budget Christmas pudding for under £1 from the Everyday Value range of Tesco. 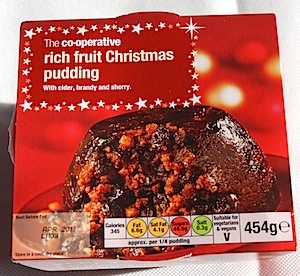 Yesterday I reviewed the Aldi budget Christmas pudding which I found to be really nice and is priced quite similar to this Tesco one. Again I found this pudding to be a perfectly acceptable Christmas pudding. It is stodgy, sweet and has plenty of fruit and spicing. This one has a variety of fruit including raisins, sultanas and mixed citrus peel, whereas the Aldi one just had sultanas. This one is has a slight citrus flavour which compliments the sweet raisins and sultanas. 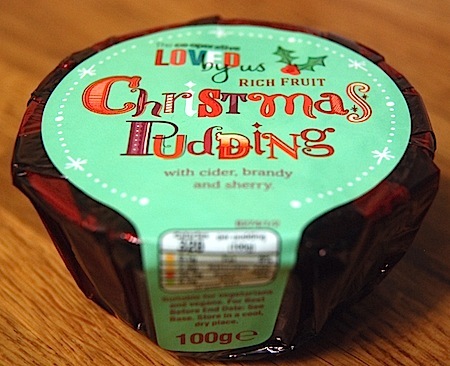 The pudding has a nice balanced flavour and I quite enjoyed it, but I also equally enjoyed the Aldi version too. Both are good choices. Each 454gram pudding is suitable for vegetarians and vegan as far as I can tell (see faq). Per 100grams is 315kcal. Sold in Tesco. 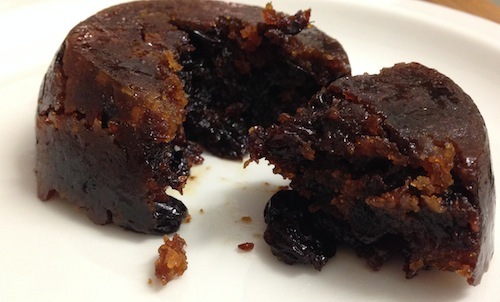 A basic Christmas pudding with sultanas and cider from the Everyday Essentials range of Aldi supermarket. 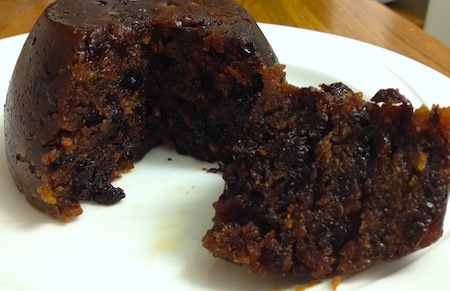 I think I am like most people, I have Christmas pudding but it is not my favourite thing, more of a tradition. I am really surprised by this budget pudding, it tasted really good. The pudding is stodgy and rich, but not as heavy as some other puddings I have tried. 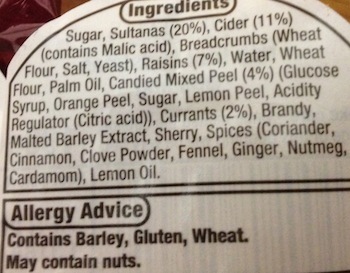 I also liked that the fruit was just sultanas, the spicing is good. This pudding says serves four people but I reckon you could get 6 portions at a push. You can microwave, boil or steam it. I did mine in the microwave and it was ready in 3 minutes, perfect for Christmas day as it is super easy. Each 454gram pudding is suitable for vegetarians and vegan as far as I can tell (see faq). Per quarter of the pudding is 376kcal. Sold in Aldi supermarket for under £1. 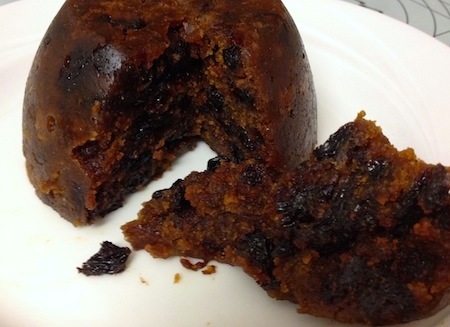 Last year I had the Christmas pudding from the Coop as they are clearly marked suitable for vegans, the pudding tasted very good and is so easy to warm up, you can either steam them or put them in the microwave. I visited the Cooperative this year to buy my Christmas pudding and there are two types that are vegan friendly. The rich fruit Christmas pudding with Cider, Brandy and Sherry and the Truly Irresistible Christmas pudding with Brandy, glace cherries, almonds, walnuts which is matured for 6 months. As I will not be trying these Christmas puddings until Christmas Day I wanted to say that they are a really good choice for a vegan Christmas dinner, they are very rich and made using vegan friendly ingredients rather than animal fats which is what is normally in Christmas puddings. They are very filling and approx 345kcal per serving, suitable for vegans and vegetarians, sold in the Coop Supermarkets. When I visited the Cooperative they were on offer, buy one get one free and they keep for ages, mine will keep until 2013. They go perfect with some vegan custard or vegan cream.